"Just give me some down and dirty mig welding tips and leave me be "
Can you really learn how to mig weld by watching a 10 minute video? Heck no... But you can sure get a jumpstart by watching this video...and that beats going it alone. Learning how to weld can be frustrating. I made this video so that people who wanted to learn how to mig weld without going to welding school would have a fighting chance. So if your that guy or gal who bought a mig welder but have not been able to make it come out right, You are in the right place. ...and you can come back and watch the video as many times as it takes to get you to the level where you need to be. Mig welding is said to be the easiest way to learn how to weld. Thats because starting the arc only requires pulling a trigger instead of striking like a match as with arc (stick) welding. Another thing that makes learning how to mig weld easier than stick welding is the wire automatically feeds into the weld puddle. Unlike arc welding (stick welding) where the electrode burns away and becomes shorter and requires the welder to manually maintain the arc length, mig welding only requires the welder to move steadily along a seam while maintaining the same tip to arc distance. I guess that makes it a little easier. I have always thought that if you learn to stick weld first, learning how to mig weld is a piece of cake. I realize I have a skewed opinion. I had the luxury of learning stick welding in school...but I realize that not everyone goes to welding school or wants to make it a career... and for someone who just wants to learn how to weld at home... Who wants to fix some things, build some stuff, do some welding art... mig welding is probably the easiest and quickest way to get started. With a mig gun, the welder can hold a part in place with one hand, and tack weld it with the other. Thats true with stick welding too, but its not as easy as mig. An auto darkening helmet makes things go even better for the beginner mig welder because with the auto darkening helmet, you can see exactly where the wire is pointing, and you know exactly where the arc is going to be before pulling the trigger. You can even use the nozzle to prop against the metal and now you have one hand free to hold the pieces in place, one hand propping the mig gun exactly where it needs to point, and a helmet already in down position that allows you to see where the arc is going to start....that really is easier than stick. Mig welding really fits the bill for welding art. For sticking random objects together, or for holding anything with one hand while you tack weld with the other , you cant beat mig. A popular way to get started mig welding is with a small 115 volt mig welder like a Hobart handler 140 or a 115 volt lincoln. The lincoln mig welders you see in Big box stores are actually pretty good little mig welders...and very affordable too. Northern Tool even has there own brand that has pretty good reviews. Craigslist usually has some pretty decent deals and sometimes people are only selling because they had polarity set wrong and think there is a problem with the mig welder. There are all kinds of options to choose from but a really good used unit is the millermatic 250 with the old knobs instead of digital readouts....Those things are almost bulletproof. The newer inverter power sources like the millermatic 211, and the millermatic passport are good machines also and are surprising on the power they have for being such small units. There are other options than Lincoln and Miller but I have not used many of them and hesitate to make a recommendation. 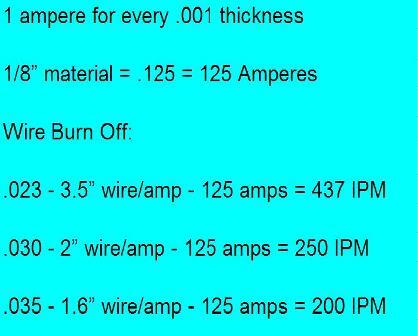 This chart gives a pretty good starting point for setting wire speed. The wire speed setting on your mig welder might not read out in inches per minute...it might read 1-7...or 1-100...those are just reference numbers. The real thing you need to know is inches per minute. And you can use a tape measure and a stopwatch to figure that out. ...or you can pull the trigger and count ...thousand one..thousand two...until you get to six. Now measure the wire that came out , round off to the nearest inch and add zero. Thats your wire speed in inches per minute. example...25 inches of wire came out on 6 seconds. add a zero to 25 and you have 250 inches per minute. The tape measure never gets out of calibration. Use the chart to get a starting point and then get a scrap piece of metal and adjust voltage to where you get a nice bacon sizzling sound. Too much wire speed and the wire will stub and the arc will be violent. Somewhere in the middle is the sweet spot. c02 is an option and is better than flux core for thin metal, but the best all around mix for anything from auto body panels, to thicker structural thicknesses like 1/4" is 75/25 argon/c02 mix. If you are in the market for a mig welder and want to learn how to mig weld, do yourself a favor and get a mig welder that can weld with bare wire and gas. Dont get the cheapest mig welder that only works with flux core. Why? because you are very limited with flux core. Flux core works great for outdoor welding where there is a breeze, but for being able to do pretty work on thin metal? It is hard to do with flux core. Trying to weld thin auto body panels with flux core usually ends with a bunch of hole blowing and head scratching. Lincoln L56 is Er70s6 bare mig wire. Its fine. But the ER70s6 is the number to look for. You can buy your mig wire at airgas, praxair, Home Depot, MSC, Grainger, or online from Ebay or Amazon. As long as you get ER70s6 your should be ok.
Make sure to get the right diameter for your mig welders drive rollers. Smaller mig machines are great for auto body work because they are usually set up to weld with .023" wire...and thats is best for auto body work. A good all around size is .030" for everything else. For fabrication using a 230 v machine, .035" works fine. No "How to Mig Weld" page would be complete without some mention of technique. A series of cursive e's is the best all around technique for learning how to mig weld.